Hundreds take to Salt Lake City streets to protest Trump. President Donald Trump told the American people in his inaugural address that starting now Washington D.C. is listening to the people. 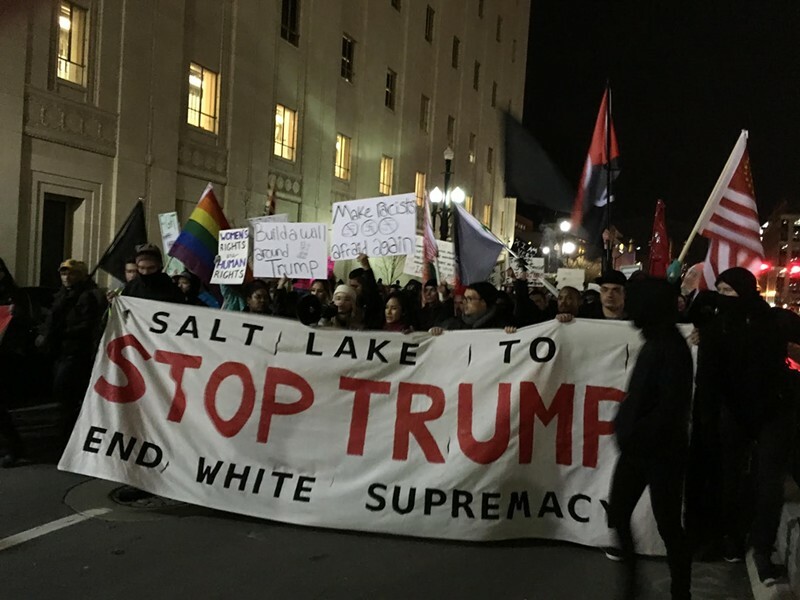 But Trump—not known for the gracious way he accepts criticism—might be less included to harken to hundreds who took to the Salt Lake City streets Friday night had to say. 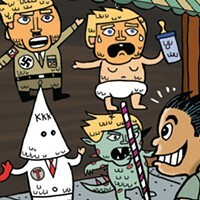 A mob of marchers chanted out disapproval of Trump’s approval by white nationalists, his hardline immigration rhetoric and his ties to anti-LGBTQ voices, among other things. 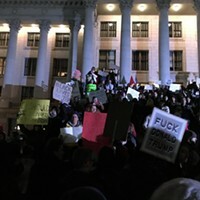 On the very night that Trump assumed the role of Leader of the Free World, Students for a Democratic Society chapter at the University of Utah organized a downtown protest. Ian Decker, a Democratic Society member, said he wanted to ensure that Trump’s radical mores weren’t normalized. Theresa Nielson, also with the Students for a Democratic Society, hopes to see a groundswell movement among the historically downtrodden. Nielson says she was heartened to see the colossal turn-out. At times, protesters expanded across the width of the road. The mass was so large that chants toward the front often didn’t match up with chants that rang in the back. “I hope this momentum continues,” she said. 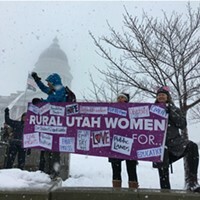 The demonstration commenced in front of the Wallace F. Bennett Federal Building, wound northwest around City Creek, continued up Main Street and then trudged up State Street to the Utah State Capitol. Protester Rebecca Barker was also impressed by the size of the group, but wished that more people would have stood against Trump before the election. Trump was prominently in the crosshairs Friday night, but the organizers didn’t give Democrats or former president Barack Obama a pass. On the steps of the State Capitol Building, a young man shouted anti-Democrat and anti-Trump slogans. A majority of people, however, were protesting the 45th president. Marcia Culley waved a pole that had a mock-Trump head atop. Students for a Democratic Society also aim to bolster the campus as a sanctuary space where undocumented immigrants don’t have to look over their shoulders for fear of deportation. Massive protest floods Capitol Building on first day of Legislature. 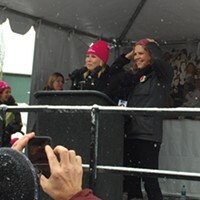 Women's rights supporters protest Trump during Sundance kickoff weekend. Sandy resident experiences her first presidential inauguration as a U.S. citizen. 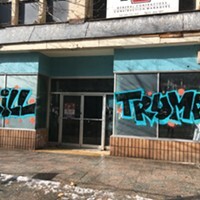 Have you ever stopped and wondered what people in Mexico think about the Donald?